Nestled in the heart of Mont Tremblant's picturesque pedestrian village and 145km from Montreal, The Westin Resort & Spa, Mont Tremblant is an idyllic getaway for any season. This all-suite resort affords magnificent views and well-appointed accommodations featuring thoughtful amenities. 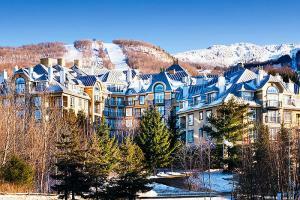 Located in Mont Tremblant village, about 90 miles from Montreal. Mont Tremblant Village; skiing, snowboarding, ice-skating, tubing in the winter; ziplining, biking and luge in the summer and fall. Gypsy Restaurant - Spanish-inspired Mediterranean cuisine. Skiing and Snowboarding, Snowshoeing, Ice Skating, Watersports, Boating, Hiking, Biking, Golf, Mont Tremblant village with more at 40 restaurants, bars and cafes.